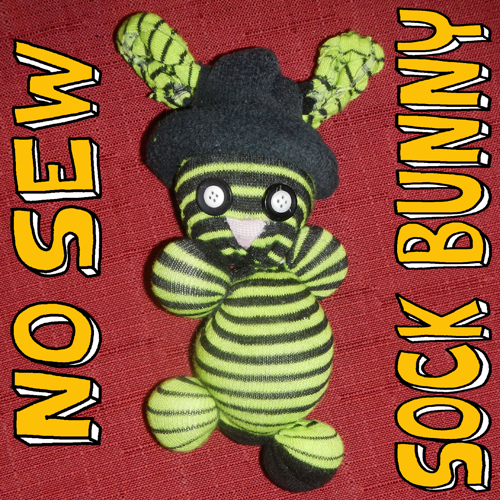 Today, we will show you how to make a sock doll bunny rabbit…the best part is that there is NO sewing involved in this craft. 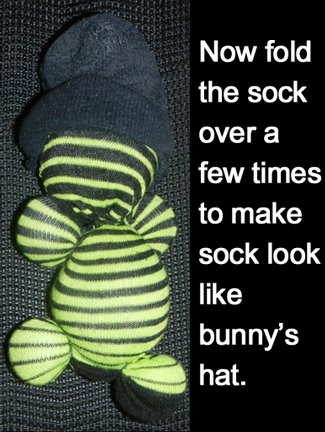 Anybody can make these sock bunnies and they can make it pretty quickly. I think you can probably make one of these is 20 or 30 minutes. 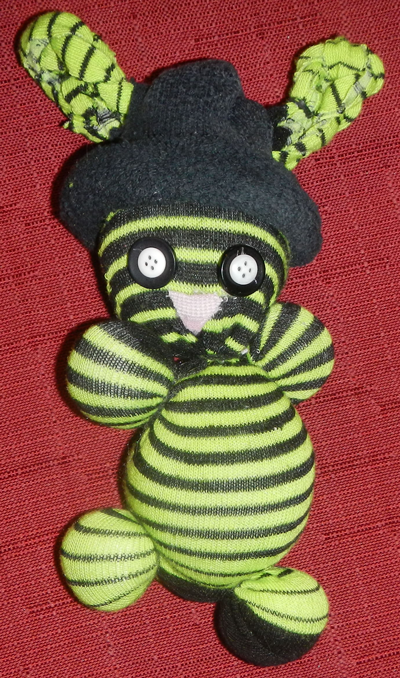 And these sock bunnies turn out so adorable that you are going to make a few of them so your bunnies can keep each other company. This shouldn’t be played with by young kids who might eat the rubber bands if they come off! 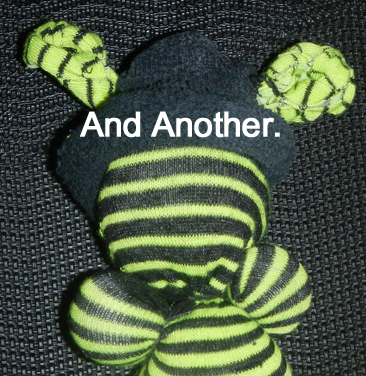 We have a crafts tutorial for making a no-sew sock doll. Steps 1-9 are the same for this tutorial…so first go to the sock doll tutorial, and do steps 1-9 and then come back to this tutorial for step 10. 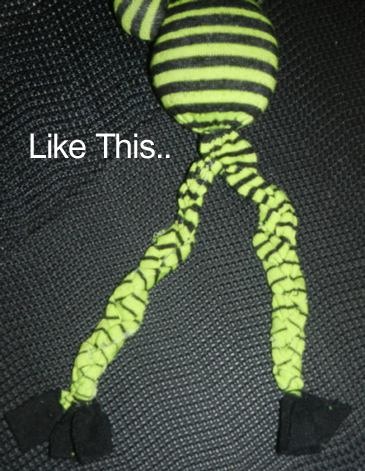 Your doll should look like the above picture when you are done with step 9. Now cut the top part in half…as seen in picture above. Now, in this picture above, we have already done one of the 2 sides. The left side has been braided already…we did this by cutting the left side into three strips and then braiding that side and rubber banding the end as if it was hair. 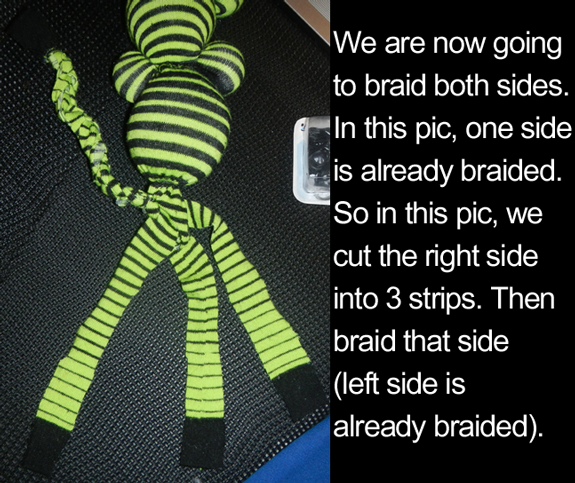 Now the right side needs to be done…we cut the right side into 3 strips…now we just need to braid it. If you don’t know how to braid, please see this tutorial. Now both sides should be braided and look like this. 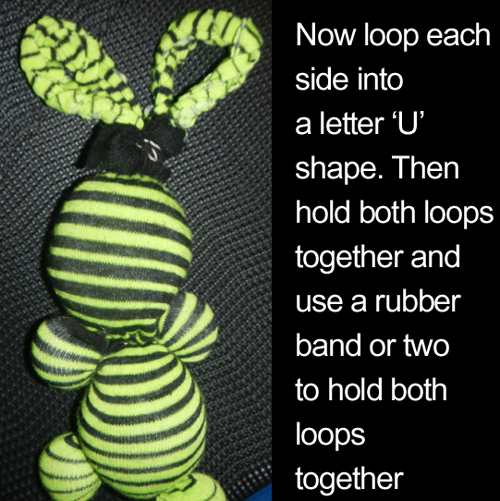 Now both the right side and left side is looped into a letter ‘U’ shape. Then hold both loops together in the center and rubber band both sides together. I used more than one rubber band to make sure both sides stayed together. 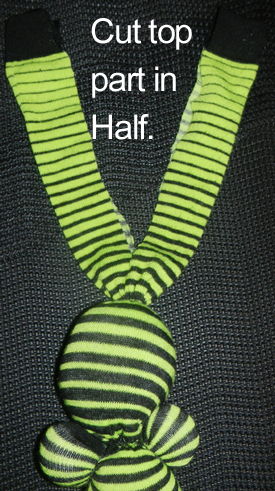 Cut a second sock in half. 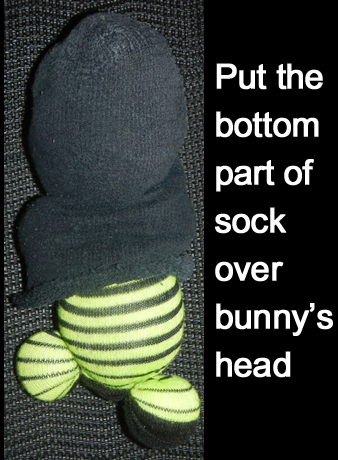 Now put the bottom of the sock (toe part) on top of the bunny. 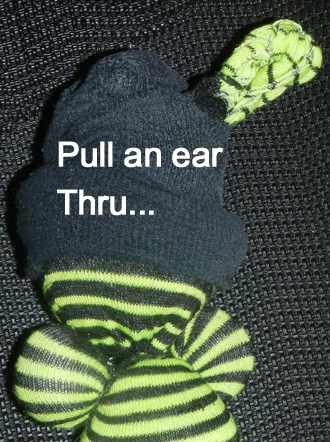 Now fold up the bottom of the sock…so it is rolled up like a normal winter hat is. 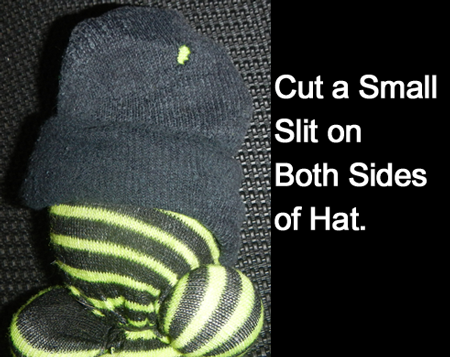 Now cut a small slit on both sides of the hat. 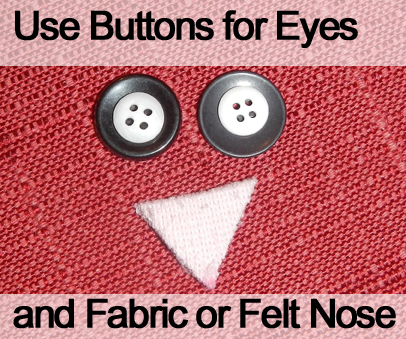 Cut a nose out of fabric or felt (a triangle shape). Use a button(s) for eyes. 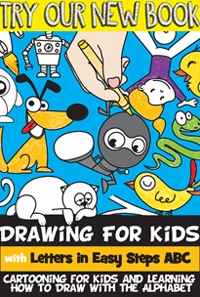 Ask mom or dad to help you hot glue the eyes and nose on. That is it…you have a stuffed bunny rabbit to play with. Wasn’t that easy?! This shouldn’t be played with by young kids who might eat the rubber bands if they come off!